It amazes me how quickly Holden will calm down when placed in his crib and having his mobile cranked up. It’s fun to sit there and watch him work to follow the monkeys round and round. I also can get a few minutes of “me” time. Granted, it’s constantly interrupted with me having to go in and wind it back up every minute or so. Why can’t they just make mobiles that run on batteries and have an automatic shut off like the swings? I’m sure I’m not the first mom to think that so I wonder what’s stopping them? They don’t want to make things too convenient for us! Thank you, GiGi for getting Holden his monkey mobile! >Ha! I had NO idea! I guess I should have read the details a little more closely on the hundreds of mobiles I looked at when I was registering! 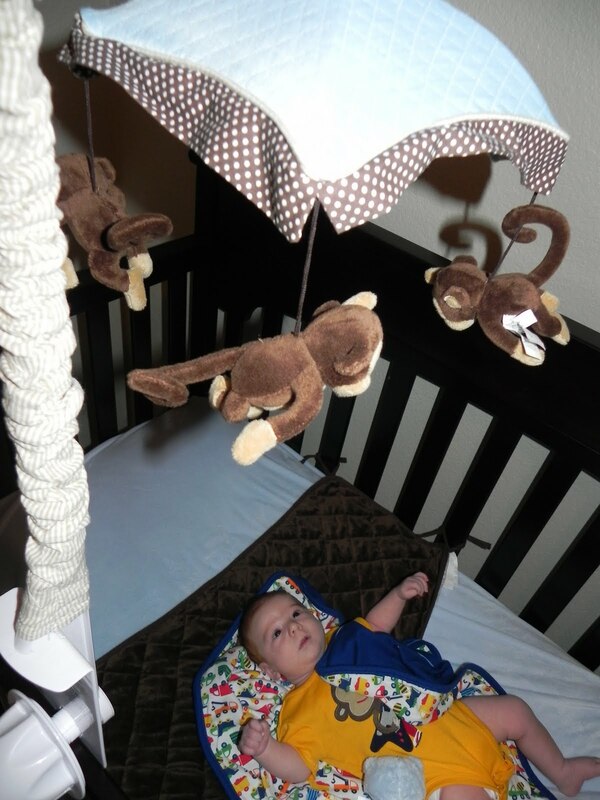 Now I'm like – he really loves this mobile and I would feel bad taking it away from him! But I am tempted…Thanks for the info, Kate!